Today we’re releasing an updated version of our Performance Platform dashboard, the tool that shows analytics data about how GOV.UK is being used. Today’s updates focus on improving the usability and readability, building on prototypes that were built through the summer, and I want to tell you a bit more about why we’ve made them. With today’s release, we’re introducing interactive hover overlays that allow a user to inspect the the data behind the graphs. These allow you to get the numbers being shown, rather than approximating from the scale. The hovers are important for us to enable our Design Principle #4: Do the hard work to make it simple. 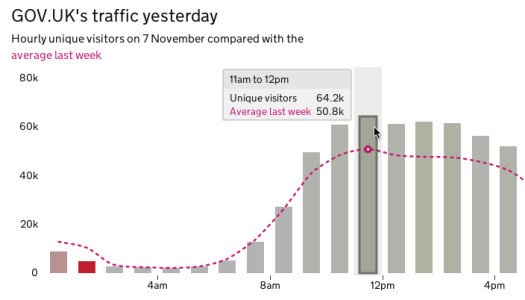 We’re designing our graphs to be simple, clear and concise; we’re avoiding ‘chartjunk’ that invades so many graphs. Having hovers allows us to achieve this, yet still provide the detail when you need it. There’s another bonus to having these hovers - they encourage people to interact and actually explore the data. See something interesting in one of the graphs? Hover over it to find out more. We’re hoping this will help people start to get a ‘feel’ for the data and thus a deeper understanding of what it describes. For future iterations we’re looking at ways of layering additional contextual information about why something might be interesting. For our graphs, we’re labelling the data itself, rather than relying on a legend. We think this is the right way for us to approach making data accessible to a wide audience because the direct labeling is easier to read and has a closer relationship to the data it represents. Using the same colour for labels and hovers as the data means that the relationship to the data is further strengthened. For the technically minded, you can get the source data we’re using to draw the graphs as json. Besides these raw feeds, we’ll look to providing a more accessible output of our source data soon. We’ve already had some great feedback on the dashboard, which we’re listening and responding to. Since launching GOV.UK we've had a large amount of web analytics data, which we’re interrogating in order to surface the most useful information. We’re rapidly iterating on what we have, focusing on better mobile support, and giving easier access to data. We are also preparing some new stuff to go along side the launch of Inside Government. Using the d3.js library we can produce some really interesting visualisations, which will help our users better explore the data, and these hovers are just the first step. Updated 19 December 2012: 'Format success' module was renamed to 'content engagement'. Blog post updated to reflect this and give correct url. Any ideas why you have 15% less visitors than Business Link and Directgov had? We are analysing trends at the moment. But we know there is a seasonal effect that visit numbers start to drop off in the autumn. 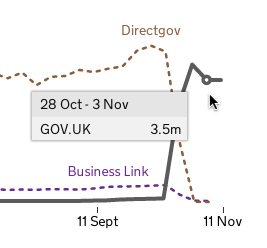 If we compare GOV.UK against Directgov and Businesslink for the equivalent period last year, GOV.UK is higher. We're looking at other factors - like traffic from search. Where is the source code for this? It's all on github. The frontend code is here (https://github.com/alphagov/datainsight-frontend). For the various other components that pull the data together your best bet is to go to the alphagov github organisation page (https://github.com/alphagov) and search for 'datainsight'. If you have any questions or comments please feel free to reply here or, even better, raise an issue on the relevant github project. It sounds like your computer doesn't know what to do with json files. The file is text, so should open fine with any text editor.